This post is sponsored by Notgrass History. All thoughts are my own. We don't celebrate many of the holidays although we do acknowledge that they exist. Which holidays to celebrate wasn't something we planned in advance, but as years have continued to pass we have been able distinguish between the holidays we celebrate and the ones we do not. Our favorites are Thanksgiving and New Year's Day. They are the ones that bring our family closer together. Although we don't put forth effort to celebrate the many other holidays on the calendar, I do find it important my daughters know about the holidays and the meaning behind them. 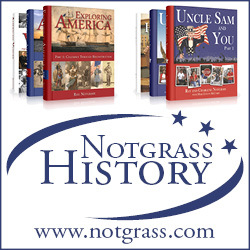 Uncle Sam and You from Notgrass Company has made teaching my daughters about the holidays a bit easier since each week it incorporates an American holiday into the schedule. One of the reasons I appreciate the weekly integration is the fact that I don't have to recall every holiday instead there is section at the back of each book with many American holidays and correlating activities. The holiday selection isn't limited to the ones that are most celebrated publically, but there are also days that many may not know much about such as Pearl Harbor Remembrance Day, Bill of Rights Day, and Loyalty Day. My daughters enjoy learning facts about culture therefore the weekly incorporation helps me to diligently engage them with information which is intriguing to them. The weekly lesson includes a hands-on activity to be completed as a family. The girls and I had a good time making the parade float in honor of the Macy's Thanksgiving Day Parade. There are a variety activities from creating 3D projects to writing books like the one about a veteran for Veterans Day. Learning about the holidays can an enrichment to your homeschool whether your family celebrates them all or not. It is a great way to connect to the history of the United States of America. Do you teach your children about the holidays? Which are your families favorite holidays to celebrate?